The thrill of getting a new puppy or dog is always met with the anxiety of how to train it. We all want friendly, cuddly dogs who get along with both our friends and their furry companions. Unfortunately, some dogs can develop bad habits or anxiety about meeting either humans or other dogs, and the result can be disastrous or scary for the pup. It is important to know your dog and know how to socialize your dog in order to keep peace in the household, with friends, or at the puppy park! Before tackling training or trying to socialize your dog or puppy, do research into the breed(s) to find out what their typical behaviors might be. Talk to fellow dog owners and find what will work best for you and your furry best friend! What is “Training” a Puppy? “Training” does not necessarily mean teaching the dog tricks. Most of the time, owners are referring to teaching the dog how to behave in society, both with humans and other dogs. If you have ever seen an aggressive dog before, you know the detriment it can cause to families and loved ones, and the conflict it can cause. We all love our dogs, but what happens when they become a threat or danger to us, our families, our friends, or other pups? The best way to treat this issue is to prevent it (because, ya know, “you can’t teach an old dog new tricks”). Although tricks can be taught at any age for most dogs, behavior traits can best be taught from a young age, or it simply gets harder from there. So starting from puppyhood to doghood, let’s take a look and see ways to best train dogs to be social with both humans and other dogs. 1. Get the timing right! Be sure not to take a puppy away from its mother or siblings too early. This can cause them both to become aggressive (because they do not grow up with the nurturing of their mother) and antisocial with other dogs, since they do not have that time to socialize with their fellow pups. It is best to wait 8-10 weeks before adopting a puppy and taking it from its mother. After that, the mother will stop caring for it as intensely, and a human is a much better fit at that point! 2. Socialize the dog! Be sure to involve your pup in as many socializing situations as possible. Taking them to obedience schools with other dogs, going to the dog park, and planning play dates with other dogs are all great opportunities for them to assimilate into the life of a playful and friendly pup. It is important to puppies, in particular, to play with other puppies. Why? It can teach them not to bite humans! 3. Schedule playdates — with people! If you want your puppy to be friendly to humans, as well, it is important let them meet, greet, and play with as many people as possible! A very cute idea to do this is to throw a “puppy party” where your friends can come and meet your new furry friend! This exposes them early to human interaction, which is shown to decrease aggressiveness in puppies towards humans. Also be sure to introduce the puppy to any neighbors, mailmen, or people that will be stopping by regularly. 4. If they live with you, they live WITH you. Adopting a dog and making them “an outside dog” is not healthy for the pup. Yes, some do require extensive exercise which may only be able to be provided sufficiently through hours of free run (in a fenced-in backyard). However, dogs are not their closely-related relative wolves. In fact, they have been almost completely bred out of their wolf-life instincts (and have been for almost 500 years). Dogs are domestic animals, meaning they need to stay inside the home during the night time and most of the day. If an animal is left outside for too long, they can actually become more aggressive, especially during the “coming back inside” phase. When a puppy is let into the home sporadically, they will become a little too excited and may get aggressive. It is best to simply let them remain inside. With the proper training, it is not that hard! 5. Let them be scared sometimes. It is important that your dog master the “fight or flight” (FoF) reactions. This biological reaction happens when an animal is scared or in danger: they will choose to either fight, such as bite or growl, or flight, which is a cool way of saying “run away.” If an animal never has exposure to this during the puppy years, it can be disastrous when they finally become fearful of something. The best way to combat this is to let them be scared sometimes: vacuum, turn on loud music, let them hear a lawn mower. All of these things will trigger their fight or flight and, with your comfort, they will find that flight is almost always the best option. It will also decrease their sensitivity to sound, so as to not trigger their FoF responses that often. If your dog is a little older than puppy age, it can be hard to instill new behaviors. The best way to help them become more social dogs with humans and other dogs is to use positive reinforcement. And this may take some time. This includes rewarding good behavior, and not rewarding bad behavior. Do not punish your dog. Dogs do not understand punishment like humans do. They just see it as being hurt, not being disciplined. Treats, behavioral clickers, and positive pets or tummy rubs lets the dog know that they are performing good behavior. Complete the steps above during puppyhood, but it might be a good idea to keep the dog on a leash for the first few times. If the dog is especially aggressive, consulting a professional might be the next step. Always ensure everyones safety before releasing an aggressive dog! 1. 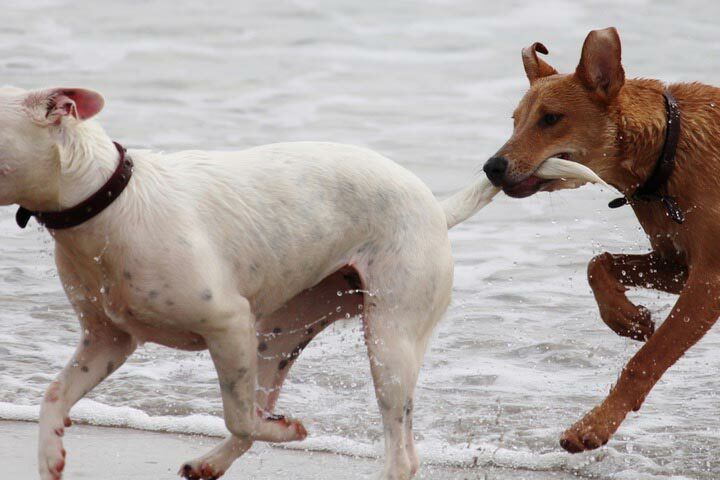 Focus on simply getting along, not “playing nicely.” As dogs age, they become stronger and sometimes more irritable. The puppy-playing may start to bother them, or their tempers may be a little shorter than that of a puppy. So, instead of trying to make them play with other dogs, try to socialize them to simply be around other dogs. Do this gradually, encouraging good behavior with treats. 2. Take it one dog at a time. Do not try to drag your grown dog along to a crowded dog park. The over-stimulation can cause their FoF to kick in and may result in some bad behaviors, even dog fights! The best way to handle adjusting your dog to new dogs is to let them make friends with each dog one at a time, then (when you feel comfortable) see how they interact together in small groups. 3. Take precautions when socializing them with people. Although they may not be aggressive, the sudden introduction to tons of people can cause their FoF in to kick in and can result in a panicked and scared or very aggressive dog. When introducing them to new people, have them sit on the couch in a normal position and then bring the dog into the room to meet them. Having a human walk in on them can cause too much excitement for a dog. Encourage the people to sit still, not paying much attention to the dog, unless he/she comes over to investigate. In which case, have them feed the dog a treat. Be sure to use proper treat-giving etiquette when administering treats. Do not hold the treat with the fingers; rather, lay the treat in the middle of the palm and stretch the hand out with the palm facing the ceiling. Do not move until the dog has taken or completely ignored the treat. Be sure not to do this with an aggressive dog, but only with a dog who has been successfully socialized a little! 4. Be patient. It really is hard to “teach an old dog new tricks.” Do not lose heart or motivation. Instead, continue practicing with the dog. Remember to be realistic: an aged dog may not learn to socialize in two weeks. This could take months, even a year, to master with confidence. Be sure to allow plenty of time to train the dog before introducing him/her to any new people. Overall, training a puppy or a dog can be a very tedious task and requires time dedication, knowledge, and understanding. When trying to socialize a dog with humans, it can be a rather stressful process, especially if the dog is showing signs of aggression, anxiety, or hyperness. In these cases, it is best to take advice from a pet care professional who could help address the issues in a stress-free and professional manner. Remember to learn the habits of the breed of dog that you have and learn from the advice and mistakes of others. In the end, it is all about the healthy and happiness of the furry friend. After making that your first priority, everything else will fall into place! Contact Paw Pals Pet Sitting for more information on dog socialization or to schedule pet sitting services.